A Celtic knot pattern $4\times4$ looks like this. You can see how it is built up on a grid. 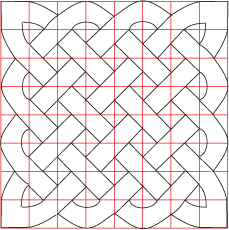 A Celtic knot pattern $8\times8$ looks like this on a grid. 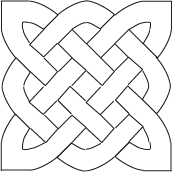 A Celtic knot pattern $6\times6$ looks like this. Can you build it up? There is a copy of the design to download here. You can do it by making a set of cards to use on a $6\times6$ grid in a $24$ cm square with four copies of this sheet. There is also a second page with two copies of the design. Or you could try doing it using this interactivity. Tangram. Art. Interactivities. Visualising. Working systematically. Combinations. Compound transformations. Addition & subtraction. Practical Activity. Investigations.